Bill Riley’s Riley Motorsports will join forces with Jim Matthews Racing to campaign a Riley Daytona Prototype for Jim Matthews and Marc Goossens in 2007. Matthews didn’t enjoy a successful early 2005 with an Orbit-run Riley chassis, he and Guy Smith struggling to finish the Rolex Series races, before stopping mid-season. The proposed new alliance is certain to be much more successful in 2007. Marc Goossens has DP experience already, and now has a permanent drive in North America. 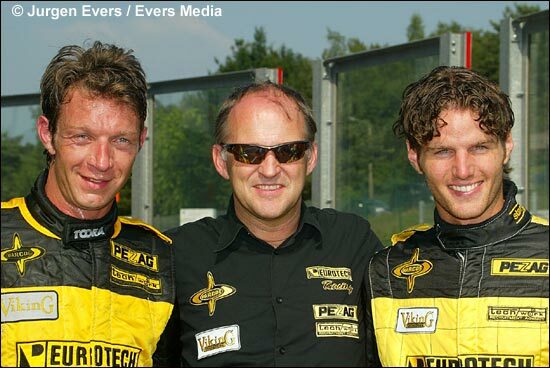 Here he is at Zolder yesterday (June 29) - with Eurotech team owner Wim Noorman and Marcos partner Danny Van Dongen. Riley Technologies and Riley Motorsports will both be moving from Indianapolis to Mooresville, N.C. Approximately 20 employees are expected to make the move, and the companies expect to have upwards of 50 employees once they settle into their new home in Mooresville.